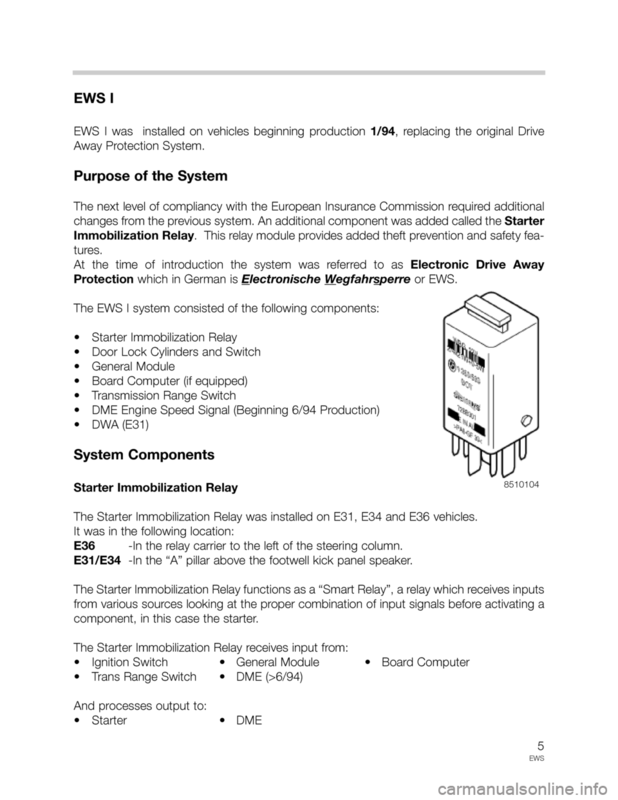 • Explain the differences in the EWS systems. 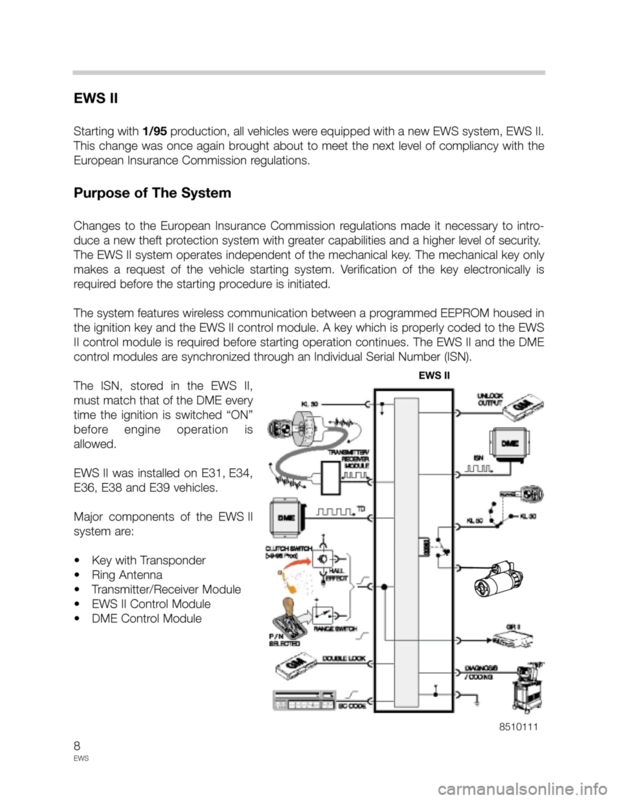 • List the components that make up the different EWS systems. • Describe the operation of each system. 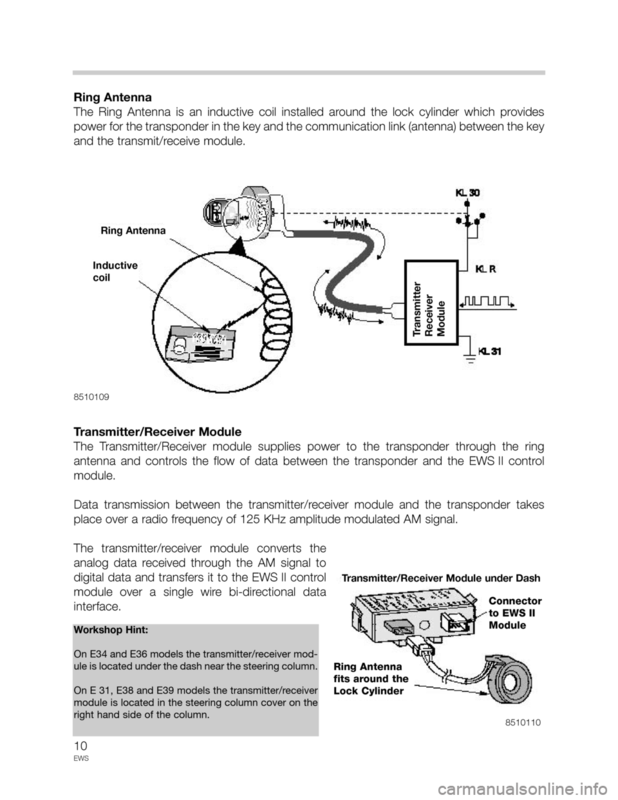 • Understand and relate the data exchange sequence between the EWS and DME. Board Computer (BC) to the DME. the outside. The switch also provides a Low signal to the GM when the vehicle is unlocked. disallow vehicle operation or a Low signal to allow vehicle operation. will either allow or prevent vehicle operation. circuit from the GM is spliced into an existing circuit from the BC to the DME. 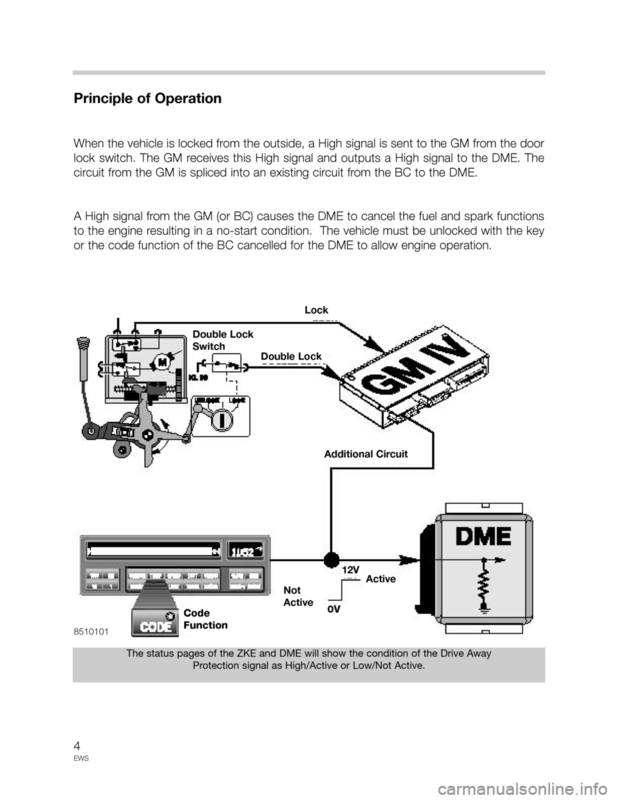 or the code function of the BC cancelled for the DME to allow engine operation. Protection signal as High/Active or Low/Not Active. E36 -In the relay carrier to the left of the steering column. E31/E34-In the “A” pillar above the footwell kick panel speaker. component, in this case the starter. of lock status. The signal is High when the system is in Double Lock. signal indicates the Code function is active. 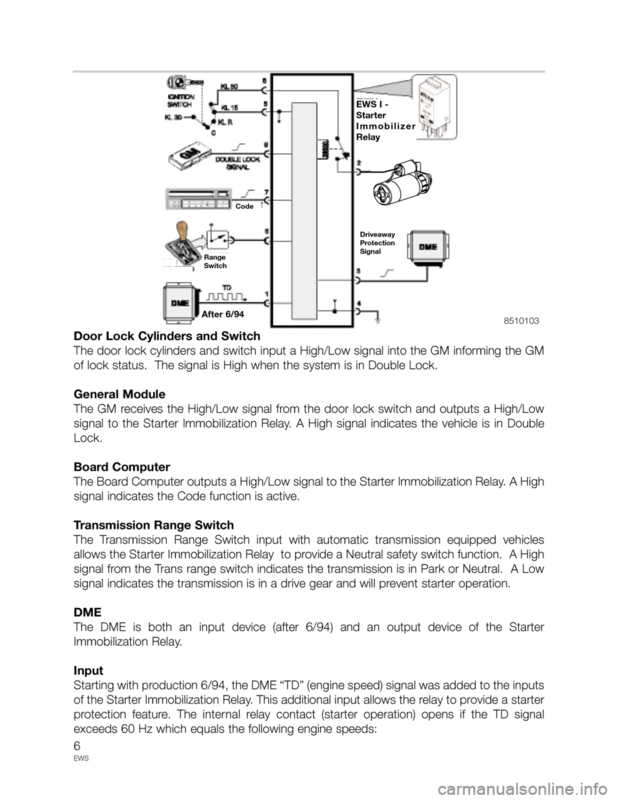 signal indicates the transmission is in a drive gear and will prevent starter operation. engine is running above these speeds. 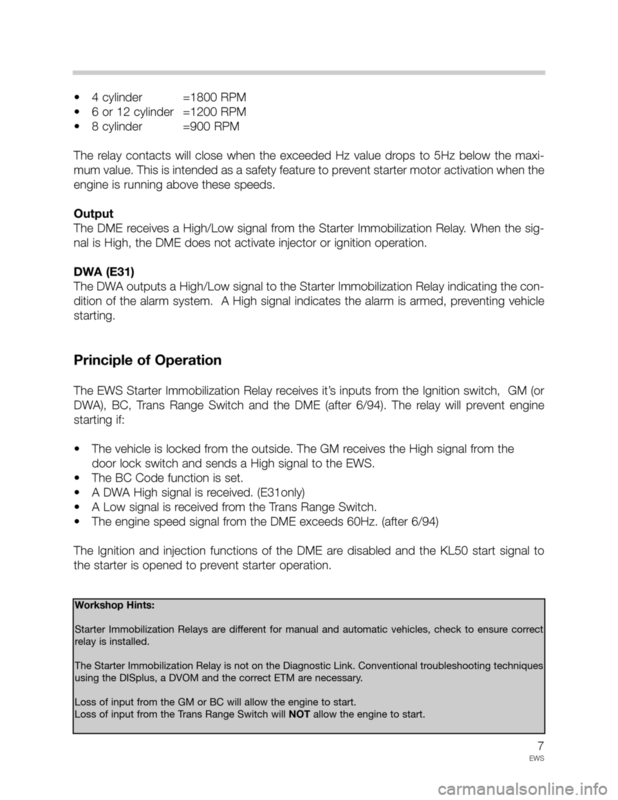 nal is High, the DME does not activate injector or ignition operation. door lock switch and sends a High signal to the EWS. the starter is opened to prevent starter operation. using the DISplus, a DVOM and the correct ETM are necessary. 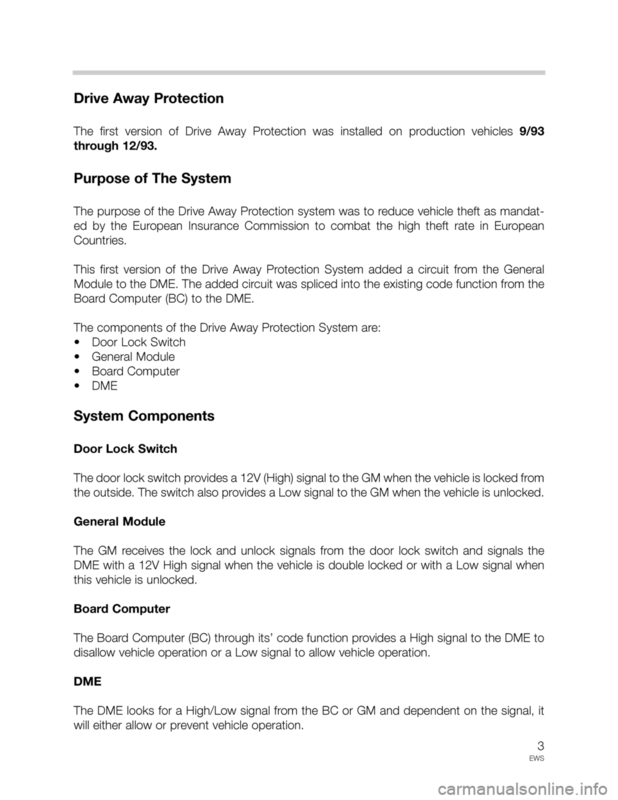 Loss of input from the GM or BC will allow the engine to start. Loss of input from the Trans Range Switch will NOTallow the engine to start. Starting with 1/95production, all vehicles were equipped with a new EWS system, EWS II. duce a new theft protection system with greater capabilities and a higher level of security. required before the starting procedure is initiated. control modules are synchronized through an Individual Serial Number (ISN). E36, E38 and E39 vehicles. voltage in the inductive coil. 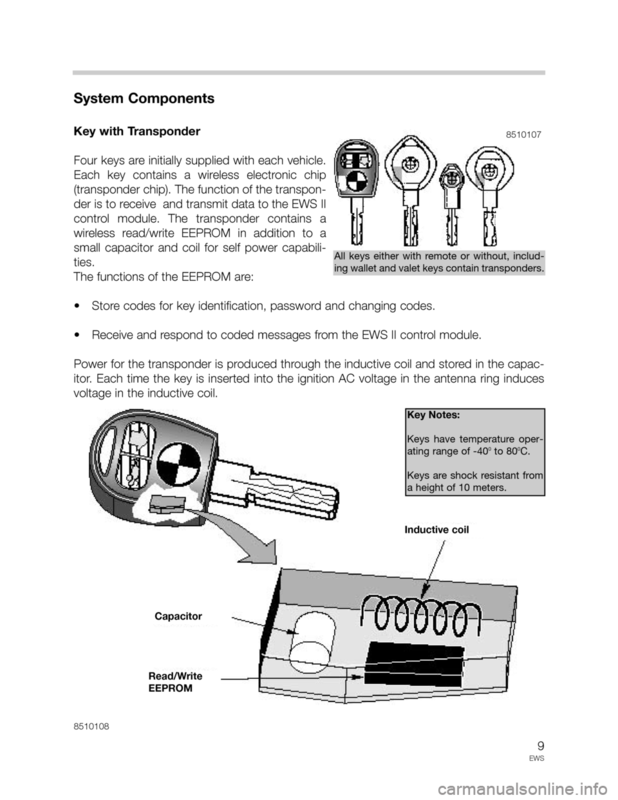 ing wallet and valet keys contain transponders. a height of 10 meters. place over a radio frequency of 125 KHz amplitude modulated AM signal. ule is located under the dash near the steering column. right hand side of the column.